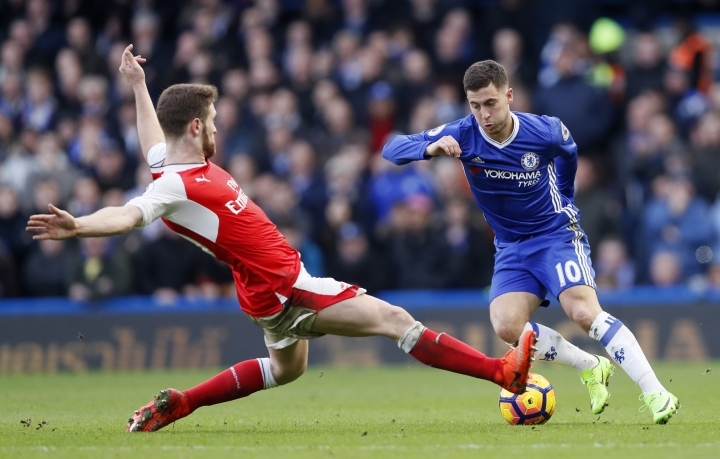 LONDON — Fusing strength, aggression and pace, Eden Hazard received the ball inside Chelsea's own half and just kept on running, fending off every frail barrier of Arsenal's resistance. Laurent Koscielny was the first opponent brushed aside and Francis Coquelin was left spinning, trying forlornly to put in a tackle before slipping to the turf. Hazard just continued to zip forward. Koscielny had darted back in defense, but was as ineffective immobilizing Hazard a second time. The fleet-footed winger weaved his way past the Arsenal captain and then outmuscled Shkodran Mustafi before slotting a low shot past goalkeeper Petr Cech. "To dribble like I did," Hazard said after his 10th goal in 23 league games, "I try to do this every game but it's not like this every game." 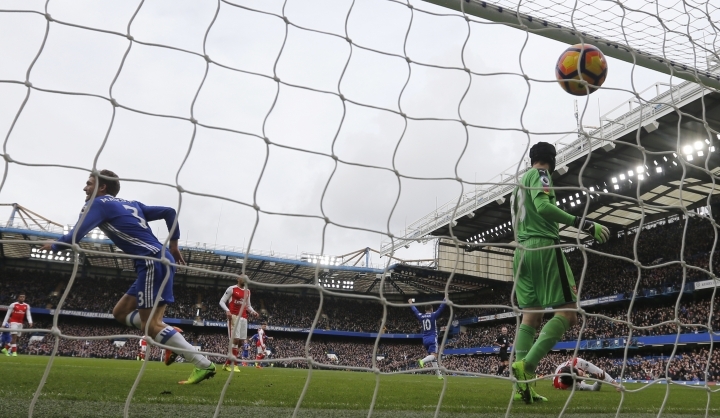 The mesmerizing solo goal came between Marcos Alonso's header and Cesc Fabregas' lob into an empty net in Saturday's 3-1 victory for the runaway Premier League leaders over Arsenal. Owner Roman Abramovich was in awe, high-fiving those around him in the executive seating. Manager Antonio Conte flung himself into the crowd behind the dugout, swarmed by fans reveling in staying nine points clear at the summit. 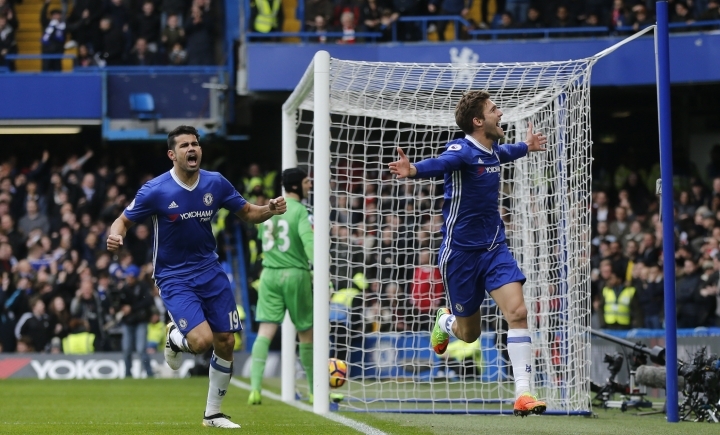 A goal of such exceptional quality embodied Chelsea's transformation since a 3-0 loss in the reverse fixture in September. That defeat saw an eight-point chasm open up between Chelsea, then in eighth place, and front-runner Manchester City. Now, Conte is well placed to end his first season as Chelsea manager by lifting the Premier League trophy, with Tottenham the closest challenge and Arsenal 12 points adrift in third. "It's important to keep our antenna very high," Conte said, "because in my career as a footballer I won a lot but I lost a lot." It is Arsene Wenger losing a lot at the moment, with his Arsenal side beaten in four of its last nine league games. "We lost many balls in positions where you cannot afford to lose it when you play against a team good on counterattack," Wenger said. Coming four days after a home loss to Watford, this was another unsettling day for a bedraggled Arsenal and Wenger, who was forced to watch from the stands as he continued his four-match touchline ban for pushing a fourth official. "I cannot do my job like I want to do it but I have to pay for what I did," Wenger said. "It is frustrating to watch from upstairs because you sit in the middle of people, they call on the phone and stand up." It was a day when they had much to celebrate, starting with Alonso's 13th-minute goal. 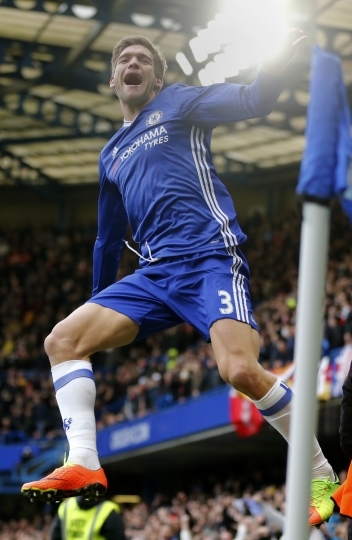 Diego Costa initially nodded a cross against the bar and Alonso darted in to meet the rebound with a header. The wing back had caught the side of Hector Bellerin's head with his arm as he leapt over the defender but he was not penalized. "One of the peculiarities of the game today is that referees are much more severe with tackles on the ground and let more go with elbows in the face," Wenger said. "It's more dangerous to hit the head." Following concussion protocols, a dazed Bellerin was forced off, with Wenger explaining, "He didn't know the score at the time." It wasn't a score anyone from Arsenal wanted to remember on a day little went the visitors' way at Stamford Bridge. Even the usually reliable Cech blundered on his return to his former club. With five minutes to go, the goalkeeper's misplaced clearance went straight to former Arsenal captain Cesc Fabregas, who lifted the ball into an empty net. There was, however, a lapse in Chelsea's concentration in stoppage time when substitute Olivier Giroud headed in a consolation. It came shortly after Chelsea reverted from three to four at the back for the closing stages. 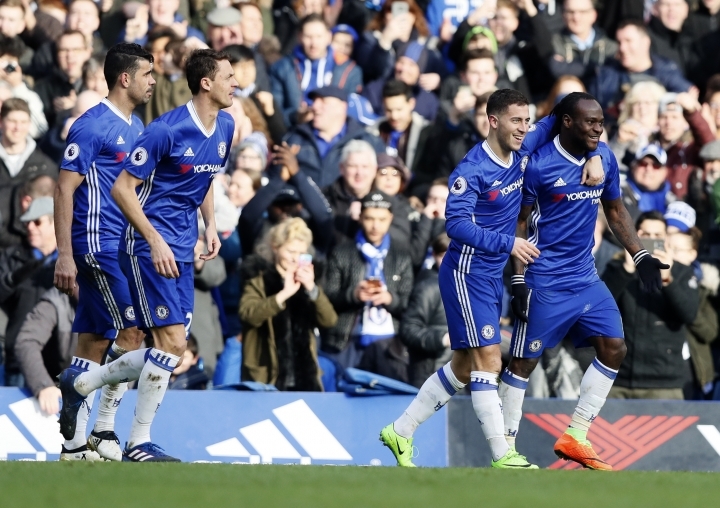 The 3-4-3 formation has been the bedrock of Chelsea's revival since being introduced at halftime of the September game at Arsenal while trailing 3-0. 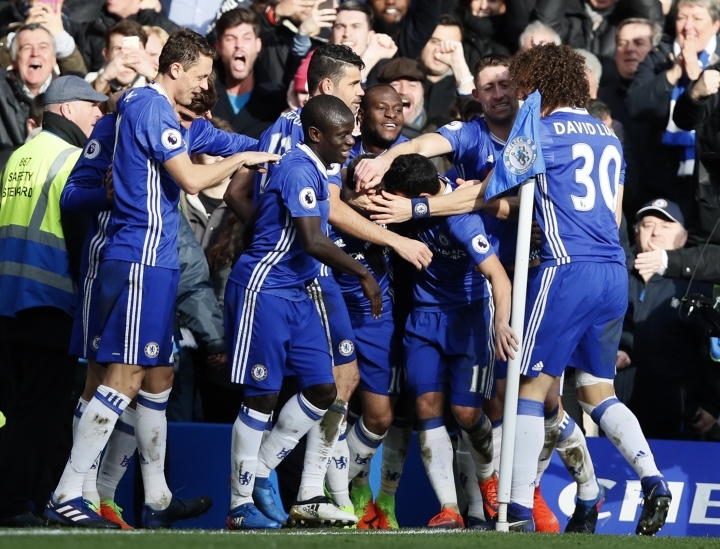 It stemmed the flow of goals that day and since then Chelsea has lost only once in the league as it looks to regain the trophy from Leicester. "I felt like a bit of a mug after that game (in September) but football gives you opportunities to put things right," Chelsea defender Gary Cahill said. "We did just that."